We're an Award-Winning Full Liquor Bar and Kitchen located on Main Street in Downtown Dunedin, FL. We offer authentic Irish Food, Cocktails, Music, and Entertainment. 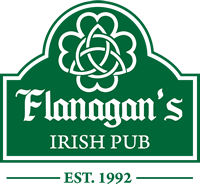 Come share a pint with us and become a member of our vast and ever-growing Flanagan's Family. Available for a Limited Time. Hurry in! Select one: The Original OG, Apple Crisp, Peach Tea, Red Hot, The Coconut, or Mint Chip. Available with vodka or whiskey. Ask your server for today's flavors. Served with fresh fruit and a splash of orange juice. Single Malt Irish whiskey. Rich, dried fruits and subtle oak notes with a smooth finish. Enjoy a 2oz pour neat or on the rocks for $6. Available Thursday-Saturday. Late Night menu options marked in green. Grilled corn tortillas, Guinness pulled corned beef, melted cheddar cheese, horseradish slaw, bacon and jalapeños. Cajun seasoned and garnished w/ shredded gouda cheese, served with our signature honey horseradish sauce for dipping. Thick cut steak fries layered with shaved ribeye steak, imported cheddar cheese curds, and our house Guinness gravy. Topped with crispy applewood smoked bacon. Three crispy potato boats stuffed with Guinness pulled corned beef, kraut, shredded cheddar cheese, and crispy bacon. Served with our house 1000 Island dressing. Extra sauce or dressing, add .50. Irish smoked haddock fish spread topped with jalapeños, scallions, and capers. Served with rye toast or crackers. Spicy pimento cheese and crackers. Beer brined, dry-rubbed, and deep fried. Served with our Guinness-infused buffalo sauce and your choice of bleu cheese or ranch dressing. Extra sauce or dressing .50. Fresh baked pretzel bread sticks and our house made beer cheese for dipping. Thin strips of dill pickles with seasoned breadeding and deep fried to a golden crisp. Served with ranch dressing. Thick cut steak fries, served with our house made Guinness gravy for dipping. Extra gravy 2. Fresh corn tortilla chips topped with our Guinness pulled corned beef, our black bean and corn queso sauce, shredded chedder cheese, scallions and fresh jalapeno. Ask about the chef’s soups, served with warm bread. Our green apple potato salad served over fresh spring greens with whiskey-infused figs, Bushmill’s candied walnuts, hard boiled egg, and shredded gouda cheese. Served with caraway bread and our house malted vinaigrette. Fresh spring greens, cherry tomatoes, red onions, cucumber and shredded cheddar chesse. Malted Vinaigrette, Bleu cheese, Ranch, Honey Mustard or 1000 Island. Add grilled chicken /5, sliced turkey /4, beef tips /9 or corned beef /5. Served with your choice of steak fries, pub chips, coleslaw, or potato salad. A blend of ground beef and savory lamb, porter-infused onions and mushrooms, applewood smoked bacon and melted gouda cheese. Served on a potato roll. Classic all beef burger with melted cheese, lettuce, tomato, onion and pickle. Served on a potato roll. Choice of cheese: Cheddar, Swiss, Gouda, Bleu, Pimento. Add bacon /2, Egg /2. A cajuned all beef burger with bleu cheese dressing, applewood smoked bacon, lettuce and tomato. Served on a potato roll. A curried blend of ground beef and savory lamb with a mango chutney, fried egg, lettuce, tomato and a curry aioli. Served on a potato roll. All ground beef burger with jalapeno-pimento chesse, applewood smoked bacon and horseradish slaw. Served on grilled sourdough. All ground beef burger with porter infused onions & mushrooms and melted swiss cheese on grilled sourdough. Guinness pulled corned beef, kraut, melted swiss cheese, and 1000 Island dressing. Served on grilled rye bread. Sliced smoked turkey, kraut, melted swiss cheese and 1000 island dressing. Served on grilled rye bread. Guinness pulled corned beef, melted cheddar cheese, applewood smoked bacon, horseradish slaw, stout grain mustard and pickles. Served on a pretzal bun. Grilled chicken breast, applewood smoked bacon, melted cheddar, lettuce and tomato . Served on a pretzel bun. Grilled chicken breast with sauteed spinach, roasted red peppers, melted swiss cheese and pesto aioli. Served on a pretzel bun. Savory irish sausage with porter-infused onions & mushrooms and melted gouda cheese. Served on a warm hagie roll. Jalapeno-pimento cheese, applewood smoked bacon, tomato and served on grilled sourdough bread. Served on a prentzal bun and topped with spinach, tomato, and pesto aioli. Pickle fries, soup cup or side salad with dressing. Ale-infused grilled bangers with a buttery caraway cabbage, smoked gouda mashed potatos and our house Guinness gravy topped with crispy bacon. A savory blend of ground beef and lamb with a red wine gravy, english peas, onions, carrots, mashed potatoes and your choice of gouda or cheddar cheese. Topped with crispy bacon. A blend of ground beef and sausage, roasted potatoes, onions and figs wrapped in a buttery pastry. Served with our Guinness gravy, topped with crispy bacon. Fresh Haddock filets hand-dipped in our ale batter. Served with our steak fries and house made remoulade. Creamy corned beef hash, topped with two fried eggs and rye toast. Two over-easy eggs, two strips of smoked applewood bacon, a banger sausage, homefries, grilled tomato slices and rye toast. All beef patty grilled on a potato roll. Add cheese .50. Served on a potato roll. Add cheese .50. Musicians & Entertainers who wish to perform at our pub should contact our booker by sending a private message through our Facebook page. Hospitality Workers will receive 50% off all drinks (excluding Top Shelf) when they present a valid work ID. Local Dunedinites will receive 50% off all drinks (excluding Top Shelf) when they present a valid photo ID. I have only been to Flanningan's once, but the time I did go, I had a wonderful time! The waitress was very nice and made sure my drink was never empty. Cage O'Hanlon was playing on stage and he was awesome! He got the crowd into his Irish tunes and really made it a great time. It is quite a far drive for us, but next time my husband and I are in Dunedin we'll swing by for a pint or two! First time here and the atmosphere was awesome. Small setting but plenty of seating. Definitely transitions over to a bar around 7pm or 8pm. Food was great, I had fish and chips and they was as close to what I grew up with in new England as I will find around here. My wife had the Shepards pie and oh my that was so yummy and steaming hot. Definitely gets loud and plenty of people drinking so not close to a family friendly quick dinner, but EXCELLENT for a group of adults. Will definitely be back to see if it is consistently good. Had a blast!!! Cage was the best and the food was delicious!! It's not really a question if you like Irish bars just go you'll love it!! Great revised menu, a little updated decor, fun entertainment and a wonderfully welcoming atmosphere are a few of the many reasons Flanagan's Irish Pub is one of best places in Dunedin! Great fun pub. The burger made with lamb and ground beef is the best burger in town!!!!!! Always fun entertainment with Cage. And you've gotta love a place where you can see men in kilts! Flanagan's has new ownership, and also some light, but tasteful remodeling inside. I was skeptical at first that it may lose some of its character. Fortunately I feel it has greatly improved. The food is authentic, well prepared, and the menu is short and sweet. Beer is cold, and the service is attentive. I lived in Dunedin for a long time, and I now go in even more than I used to. Celebrate your birthday at Flanagan's! Introduce the birthday lad or lass to the bartender on duty and they'll receive a birthday gift on the house with valid 21+ ID. Flanagan's offers seating on a "first come, first serve" basis. If you plan to bring a large party (ten or more), give us a call or message us on Facebook and we'll do our best to recommend days and times that will best accommodate you. 60 seats for 60 guests are all at your disposal. Enjoy an authentic Irish meal and ice cold bevies with friends, family, staff, or co-workers. We have two dart boards and a Touch Tunes juke box for entertainment. You send out the invites and we'll provide the ambiance. Contact us today to begin your party planning.